Weekends always seem to pass quickly but it feels like camping weekends go even faster. We set up camp in the rain on Friday and since there was lightening, my sewing was delayed a bit. I did, however, complete my Friday Night Sew In goals. 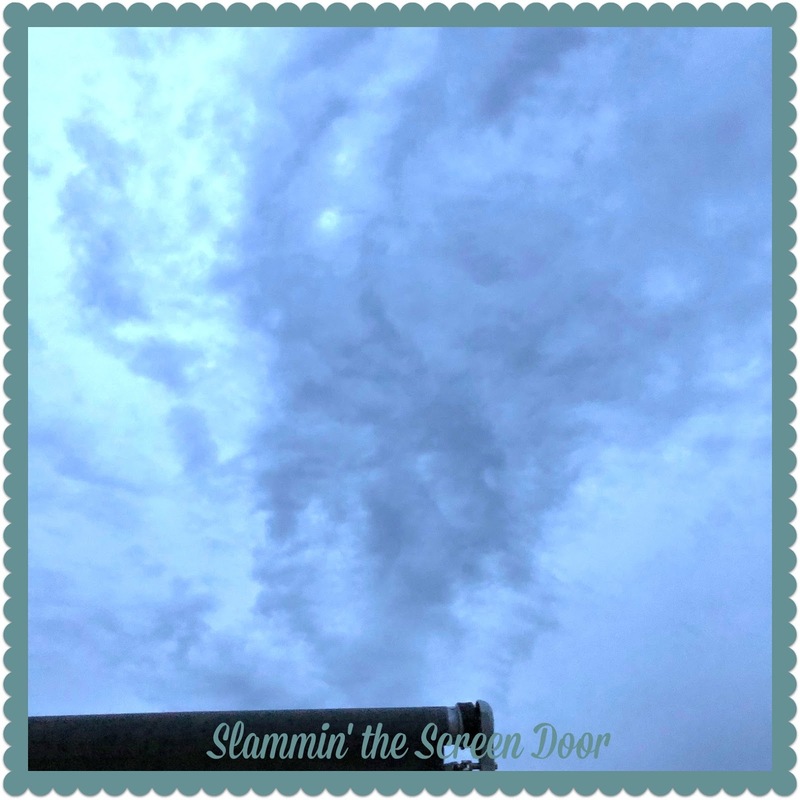 Visit Wendy at Sugarlane Designs to see how others spent their Friday night. I guess the picnic tablecloth didn’t make such a great backdrop for the photos but it was what I had. 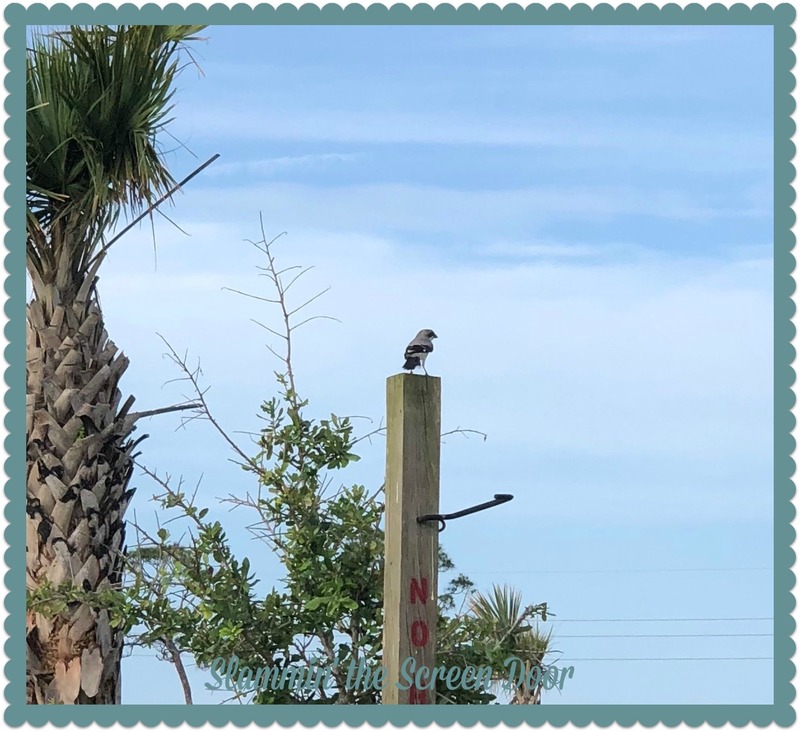 We were visited by this little Florida Scrub Jay. My husband was so excited because they are considered to be in ‘vulnerable’ conservation status. I made a light dinner Saturday night. 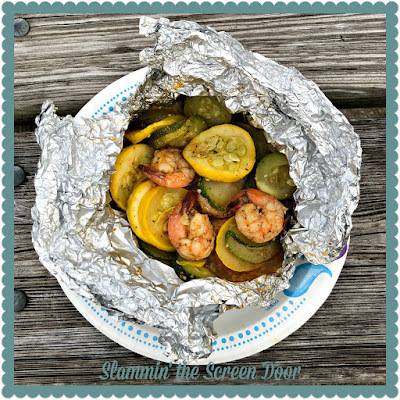 Fresh shrimp with zucchini and yellow squash, tossed in salt, pepper, Old Bay Seasoning and olive oil. Everything is put together and baked (on the grill) in the aluminum foil. Delicious meal and easy clean up. It will be back to the grind tomorrow. I hope you had a nice weekend and got to stitch some too. Love your fgv blocks. You had a nice productive weekend. Jeanna, your blocks are beautiful and I give you kudos for still being able to get anything accomplished what with camping & bad weather. However, I think your dinner looks scrumptious and I'm going to give it a try one day soon. What a wonderful way to spend the weekend. Stitching, enjoying the out of doors and cooking with no cleanup. The red and white fabrics make me think of a picnic. We did have a couple hard storms over the weekend. I had to drain some water out of the pool. Other than the rain, how good it must be to gt away for a camping weekend. We used to have a pop up camper and did family weekends and vacations using it. That was a long time ago but many good memories from it. You have a nice unit to make camping trips with. And a good set up to be able to sew. I too didn't notice at first that the red and white was a table cloth and not part of the block! Maybe it is Monday morning, LOL Glad the rain went away and you got some sewing time in. 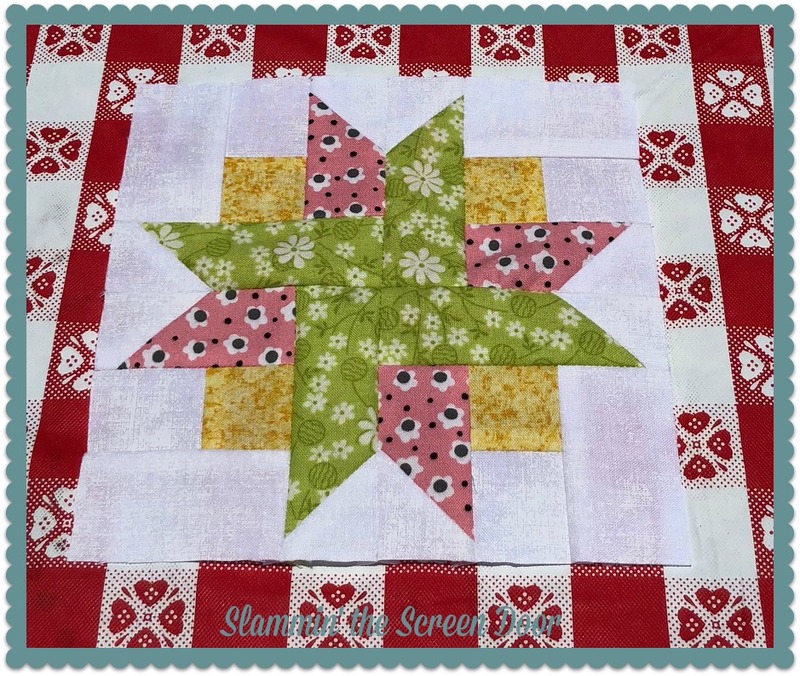 Beautiful Farm Girl blocks! Your shrimp and veggie meal looks deeeelicious! Your blocks are perfection! We have had unseasonably warm and humid weather and have been eating a lot of your veggie type meals. I MUST include mushrooms, bell peppers and vidalia onion in my combos. Beautiful Blocks! I will bet that the tablecloth is white on the reverse side? Maybe even flannel? You could turn the tablecloth over and photograph from the wrong side next time. 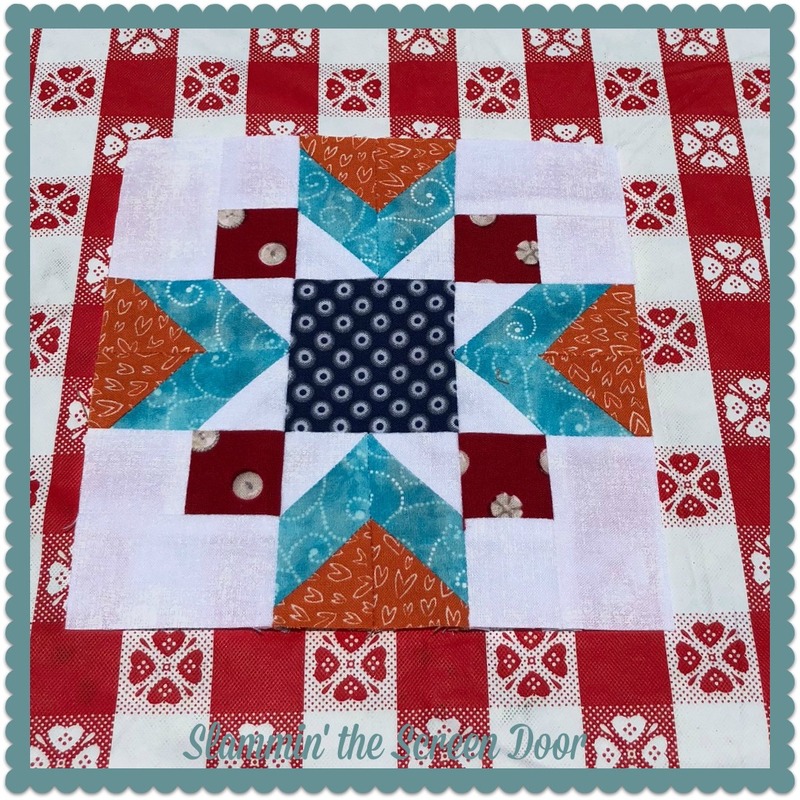 I thought the tablecloth was the border of the blocks at first, lol! Camping is always a relaxing time. 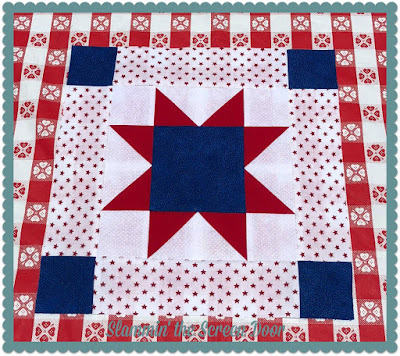 We love the blocks that you sewed. They are really beautiful. Saturday nights dinner looks really good. We are going to have a BBQ coming up soon. Thinking we might try this and see how it comes out. Looks delicious in the picture. Thanks for the share. Have a great day.